Researchers in the US have demonstrated for the first time that blood stem cells can be engineered to become specialised cancer killing T-cells that actively seek out and attack human melanoma. The study, carried out on mice, shows in principle that reprogramming blood stem cells in the living organism could be used to fight cancer in humans. The team of scientists studied T-cells (a type of white blood cell) from cancer patients, carefully isolating the receptors on the surface of the cell that correspond to a type of melanoma (tumour) in humans. The scientists isolated the genes from the receptor and introduced them in to the blood stem cell using a virus. The genes integrated with the cell DNA and became permanently incorporated into the blood stem cells, theoretically allowing them to produce melanoma-fighting cells when needed. Dimitrios N. Vatakis , one of the researchers on the project, outlines why the study is so important. "The nice thing about this approach is a few engineered stem cells can turn into an army of T-cells that will respond to the presence of this melanoma antigen. These cells can exist in the periphery of the blood and if they detect the melanoma antigen, they can replicate to fight the cancer." After the T-cells were produced in the mice using the technique described, the scientists implanted the little critters with two types of melanoma, one that corresponded to the engineered T-cells and one that did not (the control). 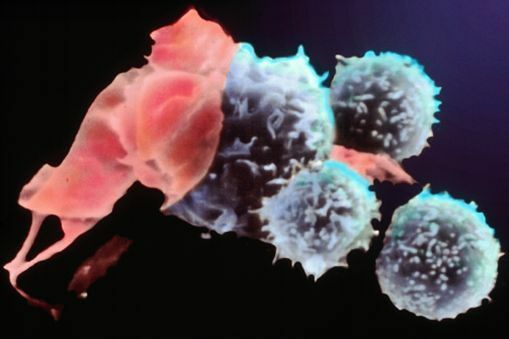 The results showed that the engineered T-cells targeted and destroyed the corresponding cancer but not the control. In the nine mice used in the study, four were cleared completely of the melanoma and the other five saw the tumours reduced! The scientists believe the study could be repeated in humans and could potentially form the basis of new treatments for a wide range of human cancers. Exciting stuff? The study was carried out at the Jonsson Comprehensive Cancer Center and the Eli and Edythe Broad Center of Regenerative Medicine and Stem Cell Research at the University of California, Los Angeles (UCLA) and the results appear in the journal Proceedings of the National Academy of Sciences.